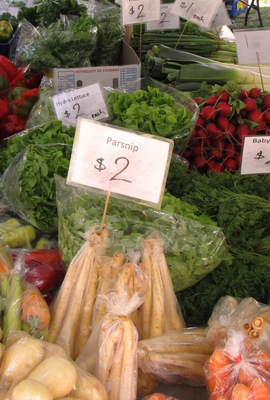 The Boggo Road Markets at Dutton Park opened with much fanfare in late October. Having given them a few weeks to settle in, I headed along one Sunday morning recently to see what they had to offer. For a start, they're in an interesting and appealing setting, among the heritage buildings of the former Boggo Road Gaol. 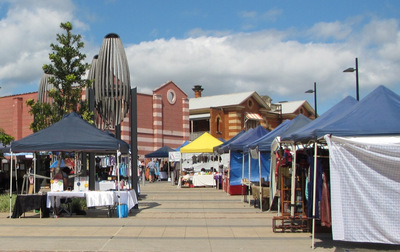 While there's no access to the gaol itself, the old buildings make an attractive backdrop to the stalls. With the sleek new EcoSciences building nearby, and well-tended lawns and gardens all around, the market looked very festive in the morning sun. But what about the stalls themselves? Well, Boggo Road has all the good things we've come to expect from Brisbane's markets -- wholesome bread in many varieties (organic and other), lots of fresh fruit and veggies (again, organic and other), decent coffee, and a heap of different yummy food. Rather than bore you by listing every stall I encountered, I thought I'd just tell you about the ones that struck me as unusual or especially good. Foremost among these was the Cape York Buffalo Pie stall. 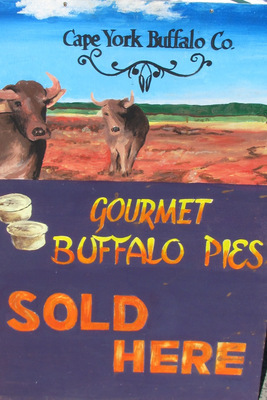 Yes, you read right -- buffalo pies, here in Brisbane. Buffalo-farmer Craig explained that he's moved from Cape York to Kilkivan, west of Gympie, where he runs a couple of hundred head of buffalo. Craig waxed lyrical about the health benefits of buffalo meat (higher in iron, protein and Omega 3 and lower in saturated fat and cholesterol than beef), then presented me with a buffalo party-pie to try. I was an instant convert -- the filling tasted like a really good, rich beef pie, the pastry (trans-fat free) was light and flaky, and the prices were reasonable. I'll be heading back to buy some more (and to try the buffalo sausage-roll) in the near future. If you can't get to the market, Craig said he also sells through some Mrs Flannery's stores. My next find was the chinese dumpling stall, where I tried both vegetarian and prawn varieties (7 dumplings for $10). They were very good, especially the prawn dumplings, which were fat and flavoursome. 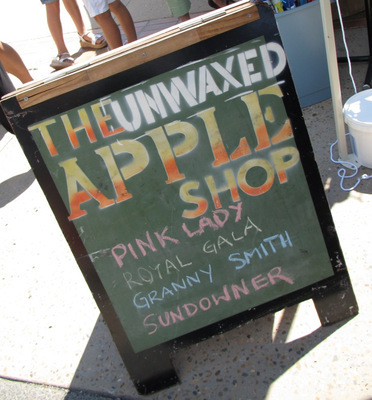 On I went to the 'Unwaxed Apples' stall, where Steve the apple guy explained to me the virtues of unwaxed apples (i.e. the state of the outside truly reflects the apple's condition inside -- sadly, this is now an unusual thing). Steve was also able to tell me which apple variety would be best this late in the season, and I took home a bag of Sundowners that proved very good. Based in Stanthorpe, Steve's father-in-law purchases his produce from local farmers each week to bring up to the markets. 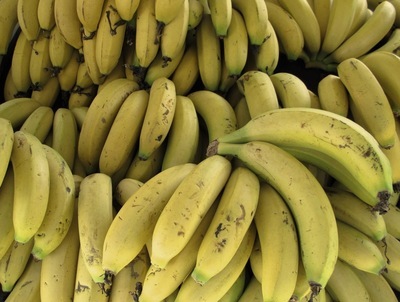 Also selling fresh fruit was the banana stall, offering bananas picked near Caboolture earlier that week for $5.99 a kilo. 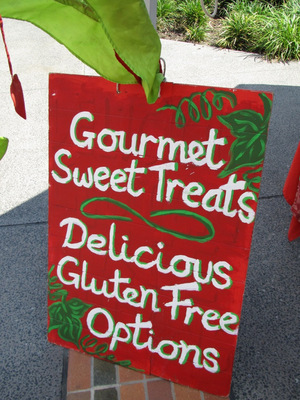 I grabbed a bag of those too, before going over to The Juicy Fig, which sells fudge and gluten-free sweet slices. I tried caramel and vanilla fudges, which I can report were very nice. The Juicy Fig also sells at the city and West End markets. 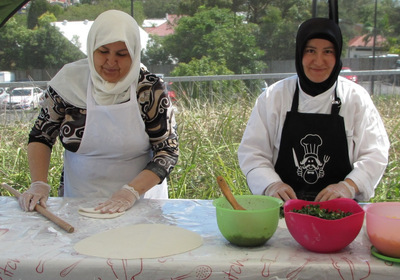 My final food find for the day was the gozleme stall, which sells traditional Turkish flat breads in spinach and fetta, spicy meat, and parsley and fetta varieties (all $8). I was too full of buffalo pie, dumplings and fudge to try one, but I saw them being made and they looked extremely appetising. Leaving behind the food, I went in search of other market exotica. Among some fairly standard clothes, craft and jewellery stalls, I came across something that thrilled my heart -- ukuleles! 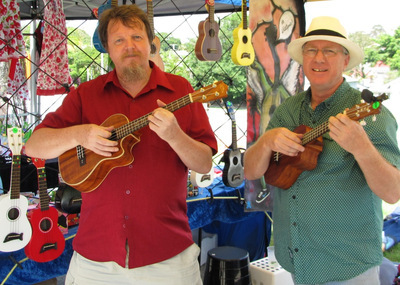 As my previous review of the Brisbane Ukulele Musicians Society revealed, I am a ukulele fan from way back, so I had great fun chatting with Peter at his Uketopia stall. He explained that there's a weekly ukulele concert at the markets, and you can also buy a ukulele and arrange lessons. 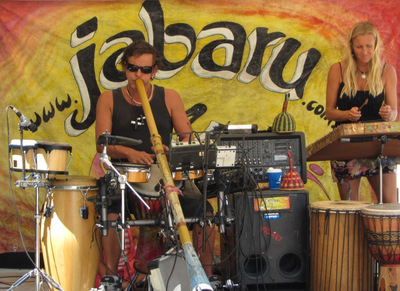 In fact, there was plenty of music going on at Boggo Road, including a blues band and a didgeridoo-infused world music duo. 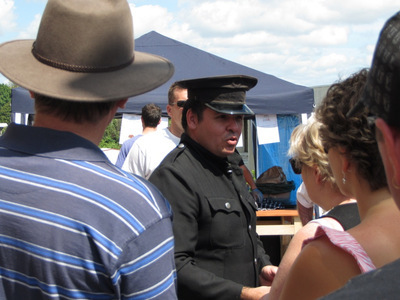 I also saw a guide dressed as an olden-day prison warden leading a tour group around, so there are quite a lot of cultural activities to enjoy there. 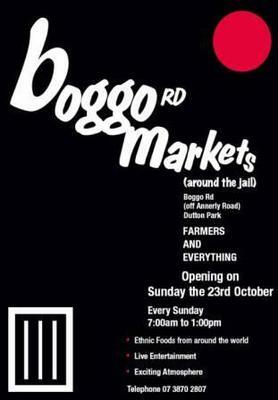 All in all, I thought Boggo Road Markets were a worthy addition to Brisbane's market scene. The setting was nice, the range was good, and there were a few standout stalls. There seemed to be plenty of free on-site parking, the paths were wide and not over-crowded, and all the stallholders were friendly and informative. My only word of advice would be to get there early; the temperature was climbing by the time I left at 10am, so this is definitely one market that will be at its best early on a summer's morning. How many more articles can be done on these markets. I will do one next week as well. OH YES THE GOZLEME pronounced gurzlem e.